Here’s a shoeper dilemma if ever I saw one: jade green or bright blue? How’s a girl to choose? 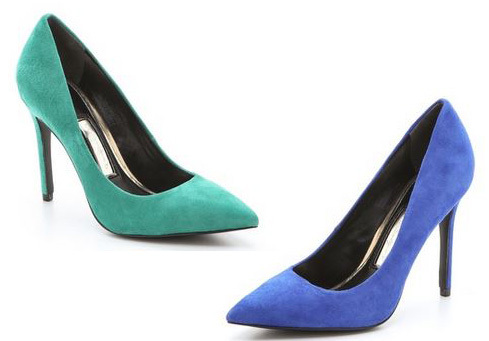 These are Boutique 9’s ‘Migs’ pumps, which are also available in black. You’re probably thinking these are very similar to the ‘Justine’ pumps I’ve shown you in the past and yes, you’re right, I thought so too. I’ll just be honest here: other than a $10 difference in the price (The ‘Justine’ style retails for $140) and the available colours of the uppers, I don’t see a whole lot to choose between these two styles. They both have 4″ heels, short pointed toes, and the kind of shape that’s very fashionable right now, but very classic the rest of the time. In other words? They’re awesome, and I want them. Both of them. In fact, I keep getting this image of an entire shelf filled with pointed-toe pumps in every colour of the rainbow. Wouldn’t that be fantastic? I’m going to do my best to resist making that idea a reality, but I guess if you DID want the same shoe in multiple different colours (Some would call that boring: I think that if you really love the shoe, and you can afford it, then why on earth not? I’ve been known to buy the same shoe in the SAME colour, though, so I’m probably not the best person to advise on this. ), ‘Migs’ or ‘Justine’ would be a good place to start: they’re good quality shoes at a decent price-point, and with a fantastic range of colours. Which brings me back to my original question: blue or green? I think blue, only because my collection of blue shoes is sadly lacking.